In my previous article I described the basics around Apache Felix OSGi. Now I'll do the same but this time I'll focus on Eclipse Equinox OSGi. I'll show you every single step you need to follow and the final goal is to end up with fully functional OSGi console. It seems that the OSGi bundle org.eclipse.equinox.console depends on a bundle which exports the package org.apache.felix.service.command. This time the dependency is not on a bundle but on a package. So here comes the hard part - we need to find which is the bundle that exports this particular package. There is no easy or straight forward way to find the bundle. Considering that we have the keyword felix, most probably the bundle is one of the org.apache.felix. * JAR files. Congratulations - you made it to the OSGi console! But... could it be so "easy"? Is there anything else? Let's see what we can do with this console! Hm... the help command prints something but it's definitely not useful. And in the very end we get another error for another missing bundle. In order to get full list of available commands we need to install, resolve and start the org.apache.felix.gogo.command bundle. Let's do it in different way this time. We already have access to the OSGi console which means that we can administer OSGi bundles. First of all, let's examine the already existing bundles and see what we've got. The command is ss. However, if we try to execute the help command again, we will end up with the same result as before. 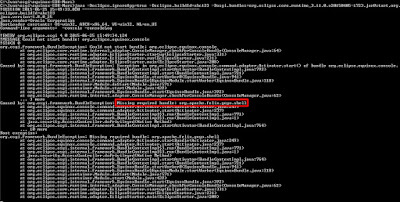 That's because our last bundle is installed but its dependencies are not resolved and finally we have to start it. Let's resolve the dependencies for the last bundle. One way to do this is to use the refresh command. As parameter we will provide the ID for our bundle, so the final command is refresh 12. As we can see now, the bundle is in resolved state which means that there are no dependencies and we can start it. The command is start and we will provide the bundle ID as parameter, so the final command is start 12. Now the bundle is running. And the good news is that Equinox OSGi keeps track of all bundles, so you don't need to install/refresh/start this particular bundle manually. And if you execute the help command again, this time you will get enormously large list of available commands. The list is really large, so I'm not going to provide screenshot. diag <id>- useful if the dependencies for bundle with ID provided as parameter can't be resolved for some reason. help <command> - Displays more information about particular command. shutdown - nice way to end the OSGi session. That's it! 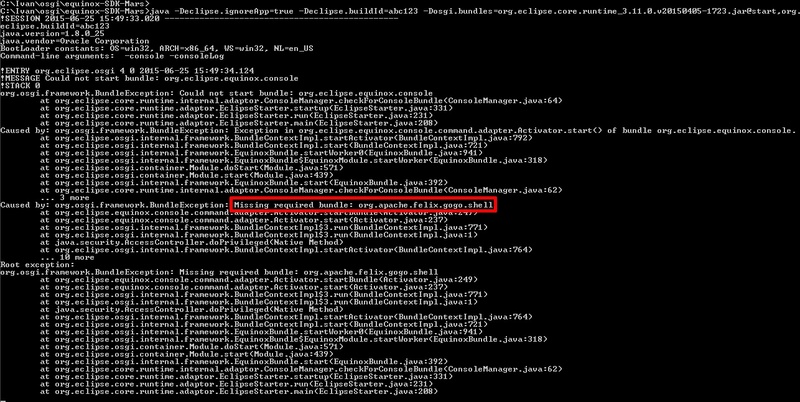 I have to admit that the Eclipse Equinox was much harder to make it run, compared to Apache Felix. The good news is that it's a one time effort. And you can always automate the process by using script files. You definitely don't want to write such complex and long command lines by hand! In my next article I'll show you how to develop a very simple OSGi application and run it both in Apache Felix and Eclipse Equinox OSGi environments.